Click on the family photos link at the right to see more pictures! 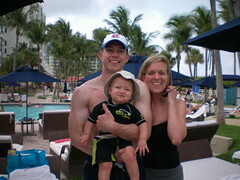 We just returned from Ft. Lauderdale. Trent had some work he had to do there so Tyler and I decided to go along with him and make it a family vacation. We had a nice time but we decided Tyler likes staying in the state of Georgia. Trent and I realized what a different time in our lives this is now as compared to our vacation last summer. You have to stop for naps and we could not seem to stretch him out past 8:00 pm. He has been a lot happier since we have been home so we think he enjoys his crib, carseat, and toys rather than those at the hotel. 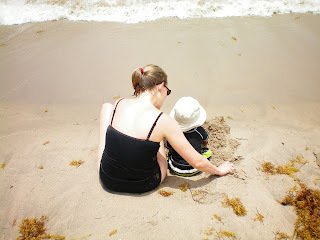 He did not seem to like the waves at first but warmed up to them over time and held on quite tightly to us. 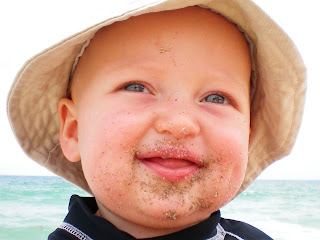 He loved playing in the sand and really enjoyed eating it when we were not looking. 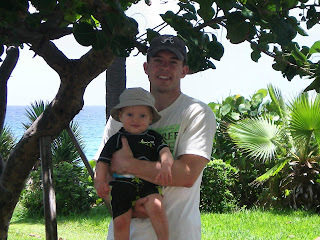 Trent and I realized that people really enjoyed watching us and laughed at our quick trips to the ocean with our little guy. It was a really nice time with our family and I am thankful we were able to go somewhere together this summer!